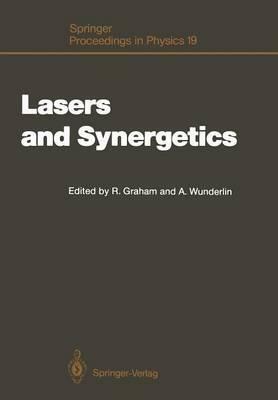 Lasers and Synergetics, written to honour Hermann Haken on his 60th birthday, is concerned with the two main areas of research to which Prof. Haken has made fundamental contributions. In fact, the two areas are interrelated since the development of the interdisciplinary science synergetics has been closely connected with the emergence of laser theory. Synergetics deals with complex systems that possess the fundamental property of spontaneous selforganization of their macroscopic behaviour. The book summarizes basic ideas, important concepts and principles used to describe selforganizing systems from a unified viewpoint. Special attention is paid to lasers, nonlinear optics and to coherence phenomena in other physical, biological and sociological systems. Some surveys of historical developments are presented, but most space is devoted to the publication of recent results and the description of current research work. Illustrations note X, 272 p.
I Introduction.- Contributions of Hermann Haken to Our Understanding of Coherence and Selforganization in Nature.- II Instabilities in Lasers.- Laser Physics: Yesterday and Today (With 4 Figures).- Recent Advances in Laser Instabilities (With 4 Figures).- Instabilities, Spatial and Temporal Patterns in Passive Optical Systems (With 11 Figures).- Optical Instabilities in Semiconductors (With 13 Figures).- III Fluctuations in Quantum Optics.- The Polarization Symmetric Laser (With 6 Figures).- Decay of Unstable Equilibria (With 3 Figures).- IV After-Dinner Speech.- Synergetics and Weltanschauung (With 8 Figures).- V Methods of Synergetics.- Boltzmann-Gibbs Entropy as a Measure of Order in Self-Organizing (Synergetic) Systems.- On the Slaving Principle.- Solutions of Fokker-Planck Equations in Terms of Matrix Continued Fractions (With 8 Figures).- VI Coherence and Structure in Physical Systems.- Ultrafast Coherent Raman Spectroscopy (With 6 Figures).- Coherence in the Transport of a Quantum Particle (With 4 Figures).- Structure Formation in Polymer Systems (With 13 Figures).- VII Selforganization in Biological Systems.- A General Approach to Complex Systems in Bioholonics (With 8 Figures).- Toward a Physical (Synergetic) Theory of Biological Coordination (With 4 Figures).- Synergetics and Social Science (With 12 Figures).- Hermann Haken's Publications.- Index of Contributors.